An online petition against parking meters in San Francisco has been gathering thousands of signatures ever since it was launched two years ago on MoveOn.org, a website that claims to host petitions that support “progressive” causes. It’s pretty easy to collect signatures from disgruntled drivers who have been stung by parking tickets, and who glance at a petition without being informed about the benefits of demand-based parking pricing. But MoveOn has actually been promoting the petition, helping to get the 4,000-some signatures it has today. Last week, MoveOn finally sent out an email announcing that its endorsement was a mistake. “We messed up,” read the subject line of the email posted in a screenshot on Twitter by Roy Mckenzie, editor of the blog The Castro Biscuit. The email was authored by Maria Tchijov, MoveOn’s platform campaign director. 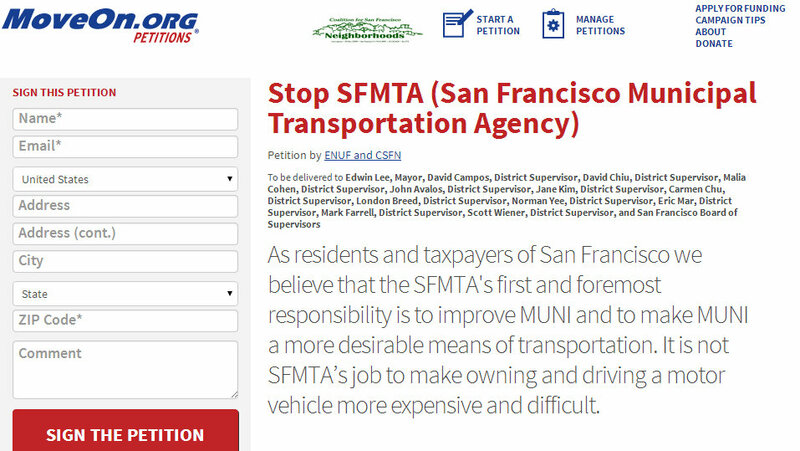 The petition, bluntly titled “Stop SFMTA,” was originally started by the Eastern Neighborhoods United Front to oppose the proposed expansion of SFpark meters into the Dogpatch, Potrero Hill, and northeast Mission neighborhoods. The SFMTA later ended its plans for meters in those neighborhoods, except for the Mission, where plans were first delayed and then watered down. Since then, the petition’s content description has been revised to adapt to the latest fads sweeping the free-parking-for-all crowd. Today, the petition lists its support for Proposition L, crafted by the SF Republican Party and funded by tech billionaire Sean Parker. At this point, the vague petition is basically an amorphous snowball that’s swept up any and all anger against parking tickets in SF, and ditched any specific goals it originally claimed to have. The target of its anti-SFMTA, anti-meter campaign is routinely moved, with the only apparent end in sight being the enshrinement of free parking (the goal of Prop L). So, how did this petition, which represents a Republican-backed ballot measure that is quickly being shunned by SF’s progressive establishment, find its way into email blasts to MoveOn subscribers? 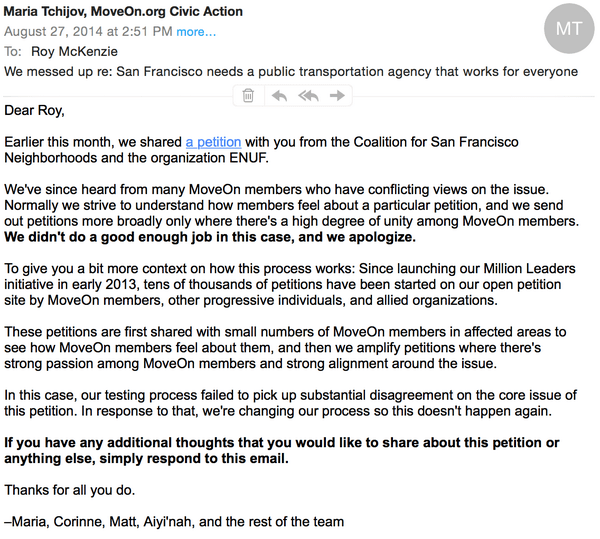 Other than MoveOn, the petition has mostly been promoted by its official backers — the Coalition for San Francisco Neighborhoods and the primary faces of ENUF, Mari Eliza and Robert Francis. Eliza once received an ironic award from Streetsblog for “Most Absurd Argument Against SFPark Meters,” and once rallied meter-haters to protest the wrong ordinance at a hearing. Francis runs an anti-SFpark website, misleadingly labeled SFpark.info, and is one of the parking warriors who can regularly found bashing the SFMTA in blog comments (under the username “sfparkripoff”) and at public hearings. By the way: If you’d like to sign a petition to “empower SFMTA” to install parking meters where they’re needed, you can check out that MoveOn petition here. Screenshot of MoveOn’s email as posted on Twitter by Roy Mckenzie. Screw it. Eliminate meters completely, then have very strict enforcement of double parking. Let it be incomprehensibly hard to find a spot, and draconian policies against those who try to get by without finding a spot. Of course, the net result would be to make it more profitable to open a parking garage than housing, and we end up in hell. So we have to instead fight the good fight rather than trying to achieve some sort of schadenfreude. Hey, let’s just have a 6 month pilot program with no tolls, no meters, no garage fees, and no tickets. That little glimpse of hell could maybe even make sfparkripoff finally shut his trap. TIL people still take MoveOn seriously. How about we put up a petition to audit SFMTA? You happen to have copies of those reports? What if there are no free parking spaces, but lots of drivers looking for them? That’s more the case of what we have in San Francisco. I think that increases the danger on the streets more than the other case you cite. There always free parking spaces when its free. There no parking spaces when parking spot are paid which allow them roam around more. That guy needs to Lighten up, Francis.